It is well known that the fund of knowledge of what it is now known as Graphic Design has been assembled from many other disciplines. On the one hand, it is possible to talk about subjects that have remained fairly stable over time, subjects such as semiotics or visual rhetoric that have given a theoretical foundation to a predominantly praxis-oriented and intuition-driven discipline, and have established bridges between design and other fields of study. On the other hand, graphic design curricula has responded to fast paced changes particularly in regards to technology by incorporating new emerging perspectives. Besides the efforts of keeping graphic design relevant in its current state, there have been calls to practitioners and educators during the last few years to transform the field into a more rigorous and structured discipline, to embrace methods that would lead designers to justify their decisions by “quantifiable means” and to embrace empirical and participatory research as a common practice. This is not to say that there has been no research on design-related topics. One of the subjects of interest for graphic designers that has produced an extensive corpus of empirical research is the influence of typography and editorial layout on reading activity. Some of this research was conducted mostly within the field of psychology by Tinker and Paterson between the mid 1920s to the late 1960s  and has been consistently revised and updated within design and other disciplines. Type design, arguably unlike any other design subject, has always relied heavily on optical approximation to induce legibility to typefaces, a fact that was denounced by Herbert Bayer in 1967 as equivalent to “lack of principle and structure, precision and efficiency”. Legge and Biggelow affirm that legibility “depends on physical characteristics of text and also on task demands, viewing conditions, and the vision status of the reader”. Although these seem to be subjective factors, Optics, the branch of physics that deals with the behaviour of light in relationship with sight has fairly rigorous protocols and procedures that can be used to inform design research and practice and pedagogy. Among these resources, I would argue one of most useful tools for type design is the principle of visual acuity. Visual acuity, the “ability of the visual system to resolve detail”, is a measurement used to prescribe vision corrective glasses based on a relation between distance from, and size of specially designed graphic props. Tinker firstly noted the explicit connection between legibility and visual acuity in 1963, but it is only recently that visual acuity has been taken over to explain optical size in type design. Ahrens’ book Size-specific adjustments to type designs, one of the very few texts dealing with optical size, devotes a chapter to this topic. The principle of visual acuity in combination with the study of the influence of certain features on the legibility of typefaces resulted in a protocol for the calculation of a numeric value that could be used to calculate the ideal size and distance based on specific features of any given typeface. This could be a potentially helpful feature for design practice and pedagogy. It also provides an approach to introduce numerically calculated optical sizes in typefaces. The protocol presented here attempts to be a step to respond to the call to provide research rigour to design methods, and aims to shed some light on a few of the processes behind the practice of type design to eventually ease its pedagogy. The available literature on typography reports on the factors influencing legibility in typefaces. Gaultney’s list of these factors include “ascenders, descenders and x-height, contrast, color and stroke weight, serif design, distinctive character features, counter shape and familiar forms”. Although all these factors have an impact on the legibility of typographic signs, not all of them can be related to visual acuity. Tracy makes this distinction by using the term legibility to refer to matters of visual perception, which can be addressed by the principle of visual acuity. Alternatively, he uses readability to refer to issues of comprehension that are influenced by many other factors. Based on this criterion, factors that do not relate solely to visual perception such as typographic color, serif design, distinctive character features and familiar forms are not addressed in this paper. For the purpose of the protocol presented here, the factors that can be related with visual acuity are classified in two categories: vertical measures which refer to optical limits, and strokes which refer to formal features of the typographic sign. The first category includes x-height, ascenders and descenders, while the second category examines contrast, weight, and counter shape. Research suggests that the x-height ―the measure from the baseline to the height of the lowercase letters― might be most important for legibility than any other factor (see Figure 1). However, ascenders and descenders have a positive influence in the recognition of words and therefore in legibility. 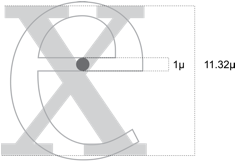 Legge and Bigelow suggest that the x-height has more influence on the perceived size than the actual metric size of the typographic sign. This is because the metric size or body height of the font is a relatively arbitrary measurement that in some cases will account for the distance between the upper limit of the highest ascendant and the bottom limit of the lowest descendant, usually k and p respectively; De Buen calls this measure the kp index. In most cases, it will account for an extra space either between the top limits of ascendants and body height, between the bottom limits of descendants and body height, or both. In some cases, particularly in swash or calligraphic fonts, the height could be even smaller that the kp index. The size of the font, commonly given in postscript points, is merely a fixed space within which all these different measurements and scenarios are negotiated by the type designer, based on the purpose of the font (See Figure 2). Figure 1. The x-height of Arial in relation with the rest of the vertical measures: Body height, ascenders and descenders. For purpose of this paper, the term strokes refers to the factors of legibility that deal with formal relations within the typographic sign. The first of these factors is contrast, a term used to define the ratio between the widths of thicker and thinner stems in a character, usually vertical and horizontal, respectively. A high contrast means an extreme variation, a low contrast a modest one. According to Gaultney there has been no extensive research on its influence on legibility, although there are expert opinions that favour a moderate use of this feature, sometimes more for aesthetic than practical reasons. It could be argued that the rule of thumb for contrast is that it tends to be low when the font has to be used in difficult reading conditions such as small sizes, long distance or high speed reading, and high in display fonts or print on coated paper. While contrast is the ratio between width of strokes, weight refers to the overall area of the sign, expressed in values like light, book or bold among many others. The empirical research reports no major differences between regular and bold typefaces, but it has been recommended to avoid extreme weights to preserve legibility. Researchers like Rubinstein have even suggested the use of quantitative ranges based on specific metrics of the typographic sign. Finally, counter shape (or counter form) refers to the inner white space enclosed by a letterform. Overall, there seems to be a general agreement on the positive influence of ample counter shapes on legibility, although this factor does not standalone, it has to be balanced with the rest of the formal aspects of the letterform and with the vertical measures. The principles for the calculation of visual acuity were developed by Herman Snellen in 1862 and are still applicable today. Snellen established a unit of 1’ (1 arc minute, 1/60 degrees) as a standard of minimum visibility and set a procedure that involves the positive identification of individual signs with identical properties. Using a grid of 5 × 5, Snellen created a series of alphanumerical signs of 5’ each called ‘optotypes’ (see Figure 3). These optotypes are arranged by size in a chart starting with one single large optotype at the top and progressively diminishing to the row with the smaller optotypes at the bottom. The chart is set at a fixed standard distance from the subject (6 meters) and the visual acuity evaluated by assessing the recognition of the optotypes. Using the height of the smallest recognizable row of optotypes and the distance, the variation between the angle that a person with ‘standard’ vision would require to identify the optotypes and the actual angle required by the subject is determined. For instance, an individual with near-sightedness or myopia would require a wider angle of vision than a person with standard vision (see Figure 4). The method for the calculation of the angle is a basic right-triangle formula, the Pythagorean Theorem, expressed as tan α = b : a, where α is the angle, b would be the distance between the subject and the optotype and a the height of the optotype. Based on this formula, according to Snellen standards for visual acuity, a person with a standard vision (5’ or 0.08333°) would be able to recognize an optotype of 8.7266 mm at a distance of 6m. Having any two values of either angle of vision, distance, or size of the optotype enables the calculation of the third (see Figure 5). Figure 3. 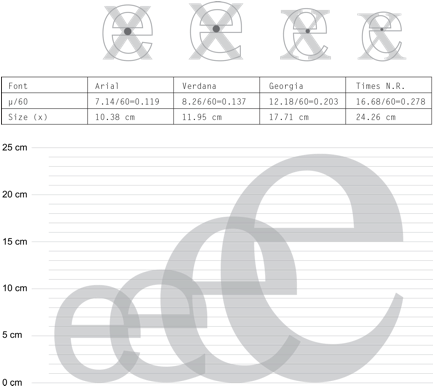 An ‘E’ optotype created from a 5×5 grid, and intended for the assessment of visual acuity. Figure 4. With respect to visual acuity, the difference between myopia and standard vision is the wider angle of vision that a myopic eye needs to perceive the same thing as a standard eye. Figure 5. The way a right-triangle formula is used to calculate visual acuity based on the size of the recognized optotypes at a fixed distance. The use of an angle for the calculation of size allows for the provision of a fixed value regardless of variations in distance, which makes it convenient for guidelines and norms, mostly related with the display of text on digital screens. For instance, the International Organization for Standardization recommends 20 to 22 arc minutes as a preferred value, the Kodak Ergonomic Handbook 14 to 22 arc minutes, and Sanders and McCormick 16 to 22 arc minutes. In the case of the International Organization for Standardization, the norms are given as “independent of technology, task or environment”. The notion of having a universal guideline for the calculation of legible font sizes is incompatible with the extent and variety of legibility factors that exist besides size, which was briefly described above. As it has been established, every font has its own requirements and design features. The idea of treating typographic signs as they were optotypes seems to overlook the fact that the purpose of the optotypes in Snellen’s method is just the contextualization of the actual unit of measurement (1’) in a distinctive and recognizable manner: the optotypes are the only vehicle of the minimum visible unit. Therefore, the possibility of using these principles for the calculation of legibility under visual acuity principles requires the definition of a unit that, given the variety of factors, would only apply to a particular font with a particular weight. Arguably, following Snellen’s procedure, such a unit would have to be defined based on the smallest necessary measurement to make an integral sign legible. Assuming that the horizontal strokes are the thinnest based on the definition of typographic contrast, and that all the signs in the font face share the same metric criteria, the smallest measure could be found in the height of the horizontal stem of any given sign, although it might be possible to find exceptions. For instance, in black and ultra weights it is common to find the smallest measure not in the shape of the letter face but in the counter form (see Figure 6). The definition of this measurement would be the first step of the protocol presented here. For the purposes of this paper, I refer to this unit as 1μ (see Figure 6). This unit would be used to measure the typographic sign in the same way arc minutes are used to measure the height of the optotypes (see Figure 7). However, based on its impact on legibility, it is not the body height of the font what should be measured, but the x-height. For the purpose of this paper, I refer to the value resulting in dividing the x-height by the smallest necessary value as relative legibility (see Figure 7). The procedure of measuring the x-height of the font face would be the second step of this protocol. Figure 6. The smallest necessary measure to identify regular and black weights of Fago. Figure 7. The procedure used to measure of the x-height of Scala in relative legibility units. The result of this operation is 11.32 μ. Figure 8. Comparison of the minimum required size to perceive Arial, Verdana, Georgia and Times New Roman according to the protocol presented here. The closest the μ value is to 0, the more relatively legible it is. Figure 9. Comparison of the maximum possible distance to perceive Times New Roman, Georgia, Verdana and Arial according to the protocol presented here. The closest the μ value is to 0, the more distance can the sign abide without losing legibility. For each case, the operations would result in a minimum perceptible size and maximum distance respectively, likely too small or too far to be read comfortably. Some adjustments might be recommended. From the type design perspective, the application of visual acuity principles seems to provide some level of theoretical background to practices that have emerged from experience, and scientific proof for concepts derived mostly from trial and error. The most obvious application of this protocol in type design is the development of optical sizes, a practice that has been mastered over the years but has had very little documentation. Even literature dealing with the creation of optical sizes from a technical point of view give rather vague instructions: “Determining the correct axis map for an optical size axis is more art than science, requiring testing and visual judgement. The procedure entails first making an educated guess at a suitable axis map [...]”. This is not to say that this protocol would account for all the circumstances involved in the design of optical sizes, but it could help to establish basic guidelines for some of the factors involved such as weight, contrast or x-height of the typographic signs. For the purpose of demonstrating the possible application of this protocol in the development of optical sizes, I analyzed Adobe Jenson Pro, a font with 4 optical sizes: Caption, Regular, Subhead and Display, at a fixed distance of 30 cm. The results are presented below (see Figure 10). Figure 10. Minimum visible height of Adobe Jenson Pro x-heights and corresponding body size of its optical sizes at a distance of 30 cm., according to the protocol presented here. I would argue that the introduction of what I refer to as relative legibility during the early stages of type design could inform positively the planning process of derived weights and optical sizes. It might also be possible to generate ranges and recommendations based on these visual acuity principles and the intended use of the font. These recommendations could be part of a future research endeavour based on what has been presented in this paper. To demonstrate how this protocol could inform the type design process, I induced relative legibility values to the letter case ‘e’ of a hypothetical font. These values are 10μ, 14μ, and 24μ (Figure 11). Figure 11. Three lower case ‘e’ designed on relative legibility induced values, according to the protocol presented in this paper. From left to right: 10μ, 14μ and 24μ. It is important to point out that these same principles could also be applied to non-typographic glyphs within a font or to any graphic sign. In these cases it would be necessary, just like with typographic signs, to identify the smallest element within the sign and use it as a unit to measure the rest of the sign for the determination of its relative legibility. Moreover, the addition of other values such as speed (distance/time) could contribute to other applications such as traffic signs. In this paper, I introduce a protocol based on optometric methods for the evaluation of visual acuity as a tool to assist designers in making decisions related to typography, as a resource to justify those decisions, and to demystify a few of the design processes involved in type design, at least for novice practitioners. This protocol consists of 1) the identification of a measure minimally sufficient within a typographic sign for the integral identification thereof and 2) the measurement of the x-height based on this new unit. Here, I have demonstrated how the combination of the outcomes of the application of this protocol to existing typefaces, or its considerations for fonts in development —among with other values like distance or intended size—, could inform not only the practice and pedagogy of design, but could also inform the creation or amendment of current standards and norms that seem to overlook basic typography principles. The development of these recommendations could be a future endeavour. The intention behind this protocol is not the eradication of the craftsmanship within type design, but the provision of theoretical support to some of its aspects, and to present a case for the use of methods and practices from other disciplines. By doing so, I attempt to respond to the call for more rigorous design methods and pedagogical practices, particularly at a time when other fields of study are looking towards design. See Armstrong, Helen. Graphic Design Theories: Readings from the Field. New York: Princeton Architectural Press, 2009. In Legge, Gordon E., and Chales A. Bigelow. "Does Print Size Matter for Reading? A Review of Findings from Vision Science and Typography." Journal of Vision 11, no. 5 (2011): 22. As defined by the Oxford English Dictionary: "Optics, n." OED Online. Oxford University Press. 2015. http://www.oed.com/view/entry/132063. See Ehses, Hanno H.J. Semiotic Foundation of Typography. Vol. 1. Halifax, Nova Scotia: Nova Scotia College of Arts and Design, 1976; Gambarato, Renira Rampazzo. "Peircean semiotics in the context of design praxis: abduction and perception in dialogue." Sign System Studes 41, no. 4 (2013): 424-432; Heller, Steven, ed. The Education of a Graphic Designer. 2nd Edition. New York: Skyhorse Publishing Inc, 2005 and Ockerse, Thomas, and Hans van Dijk. "Semiotics and Graphic Design Education." Visible Language 13, no. 4 (1979): 358-378. See Bonsiepe, Gui. "Visual/Verbal Rhetoric." Zeitschrift Der Hochschule Für Gestaltung 14/15/16, 1965: 23-40 and Lupton, Ellen, and Hanno H. J. Eshes. Rhetorical Handbook: An Illustrated Manual for Graphic Designers. Halifax, Nova Scotia: Nova Scotia College of Art and Design, 1996. See Bennet, Audrey. Design Studies : Theory and Research in Graphic Design. New York, NY: Princeton Architectural Press, 2006. See Beekman, Anne. "Good Work! Incorporating Service Learning into Graphic Design Curriculum." Mid-America College Art Association Conference. Mid-America College Art Association, 2012 and Spruce, Jon, and Martyn David Evans. "Supplying the Demand: Aligning Product Design Curricula and the Professional Practice of Design." Proceedings of E&PDE 2013, the 15th International Conference on Engineering and Product Design Education. Dublin, 2013. See Bonsiepe, Gui. "A Step Towards the Reinvention of Graphic Design." Design Issues 10, no. 1 (1994): 47-52 and Findeli, Alain. "Rethinking Design Education for the 21st. Century: Theoretical, Methodological and Ethical Discussion." Design Issues 17, no. 1 (2001): 5-17. See Gunn, Wendy, and Louise B. Løgstrup. "Participant Observation, Anthropology Methodology and Design Anthropology Research Inquiry." Arts and Humanities in Higher Education 13, no. 4 (2014): 428-442. See Paterson, D.G., and M.A. Tinker. "Influence of Line Width on Eye Movements." Journal of Experimental Psychology 27, no. 5 (1940): 572-551; Paterson, D.G., and M.A. Tinker. "Influence of Line Width on Eye Movements." Journal of Educational Psychology 34, no. 9 (1943): 547-551; Paterson, D.G., and M.A. Tinker. "Studies of Typographical Factors Influencing Speed of Reading. II. Size of Type." Journal of Applied Psychology 13, no. 2 (1929): 120-130; Paterson, D.G., and M.A. Tinker. "The Relative Readability of Newsprint and Book Print." Journal of Applied Psychology 30, no. 9 (1946): 547-551; Tinker, M.A. "Experimental Studies on the Legibility of Print: An Annotated Bibliography." Reading Research Quarterly 1, no. 4 (1966): 67-118; Tinker, M.A. "Influence of Simultaneous Variation in Size of Type, Width of Line, and Leading for Newspaper Type." Journal of Applied Psychology 47, no. 6 (1963): 380-382; Tinker, M.A. Legibility of Print. Ames: Iowa State University Press, 1963; Tinker, M.A. "The Relative Legibility of the Letters, the Digits, and of Certain Mathematical Signs." The Journal of General Psychology 1, no. 3-4 (1928): 472-496; Tinker, M.A., and D.G. Paterson. "Studies of Typographical Factors Influencing Speed of Reading. III. Length of Line." Journal of Applied Psychology 13, no. 3 (1929): 205-219 and Tinker, M.A., and D.G. Paterson. "Studies of Typographical Factors Influencing Speed of Reading. V. Simultaneous Variation of Type Size and Line Lenght." Journal of Applied Psychology 15, no. 1 (1931): 72-78. See Spencer, Herbert. The Visible Word. 2nd Edition. Edited by Royal College of Art. London: Lund Humpries in Association with the Royal College of Art, 1969; Dyson, M.C. "How Physical Text Layout Affects Reading from Screen." Behaviour & Information Technology 23, no. 6 (2004): 377-393; Dyson, M.C., and J.C. Kipping. "Exploring the Effect of Layout in Reading from Screen." In Electronic Publishing, Artistic Imaging, and Digital Typography , edited by Roger D. Hersch, Jacques André and Heather Brown, 294-304. Berlin: Springer, 1998 and Legge and Bigelow 2011. Cheng, Karen. Designing Type. New Haven: Yale University Press, 2006: 10-11. Legge and Bigelow 2011: 6. Consilium Ophthalmologicum Universale. "Visual Acuity Measurement Standard." Italian Journal, 1984: 8. Ahrens, Tim. Size-Specific Adjustments to Type Designs. Mark Batty, 2008. See Shaw, Paul. "For Them, Size Really is Everything." Eye, 2009: 91. See Tinker 1928, Tinker 1963, Spencer 1969, Dyson and Kipping 2001, Dyson 2004, Legge and Bigelow 2011 and Rabinowitz, Tova. Exploring Typography. Boston: Cengage Learning, 2015. Gaultney, Victor. "Balancing Typeface Legibility and Economy." 2001. http://uwa.edu.au/__data/assets/pdf_file/0006/25188/BalanLegEcon.pdf. Tracy, Walter. Letters of Credit: A View of Type Design . D.R. Godine, 2003. See Gaultney 2009 and Poulton, C.E. "Size, Style and Vertical Spacing in the Legibility of Small Typefaces." Journal of Applied Psychology 56, no. 2 (1972): 156-161. De Buen, Jorge. Manual de Diseño Editorial. 4th Edition. Gijón: Trea, S.L., 2014. Nichols, Robin, and Patricia Saunders. "Arial." Edited by The Monotype Corporation. 1982. Twombly, Carol, and William Caslon. "Adobe Caslon Pro." Edited by Adobe Systems Incorporated. 2001. Henestrosa, Cristobal, and Raúl Plancarte. "Gandhi Serif." Edited by Librerías Gandhi S.A. de C.V. 2012. Bilak, Peter. "Fedra Serif A." Edited by Typotheque type foundry. 2006. Gelderman, Marteen. "A Short Introduction to Font Characteristics." TUGBoat 20, no. 2 (1999): 96-104. By Gaultney 2009 and Gelderman 1999, for instance. Rubinstein, Richard. Digital Typography: An Introduction to Type and Composition for Computer System Design. Boston: Longman Publishing Co., Inc., 1988. See Bringhurst, Robert. The Elements of Typographic Style. 4th Edition. Vancouver: Hartley & Marks, 2013 and Spencer 1969. See Bringhurst 2013 and Watts, Lynne. Legibility in Children's Books: A Review of Research. Windsor: NFER Publishing Company Ltd., 1974. Snellen, Herman. Probebuchstaben zur Bestimmung der Sehschärfe. Utrecht: Van de Weijer, 1862. "Myopia, n." OED Online. Oxford University Press. 2015. http://www.oed.com/view/Entry/124516. International Organization for Standardization. ISO 9241-303: 2011 Ergonomic Requirements for Office Work with Visual Display Terminals (VDTs)—Part 3: Visual Display Requirements. International Organization for Standardization, 2011. The Eastman Kodak Company. Kodak’s Ergonomic Design for People at Work. 2nd Edition. Rochester: John Wiley & Sons, Inc., 2003. Sanders, Mark S., and Ernest J. McCormick. Human Factors in Engineering and Design. 7th Edition. New York: McGraw-Hill, 1993.
 International Organization for Standardization. ISO 9241-303:2011 Ergonomics of Human-System Interaction - Part 303: Requirements for Electronic Visual Displays. 2015. http://www.iso.org/iso/iso_catalogue/catalogue_tc/catalogue_detail.htm?csnumber=57992. Schaefer, Ole. “Fago.” FontShop International, 1999. Majoor, Martin. "Scala Regular." FontShop International, 1995. Carter, Matthew. "Verdana." Carter & Cone, 2008. Carter, Matthew. "Georgia." Carter & Cone, 2006. Office, Monotype Type Drawing, Stanley Morrison, and Victor Lardent. "Times New Roman." The Monotype Corporation, 2008. Slimbach, Robert. "Adobe Jenson Pro." Adobe Systems Incorporated, 2000.